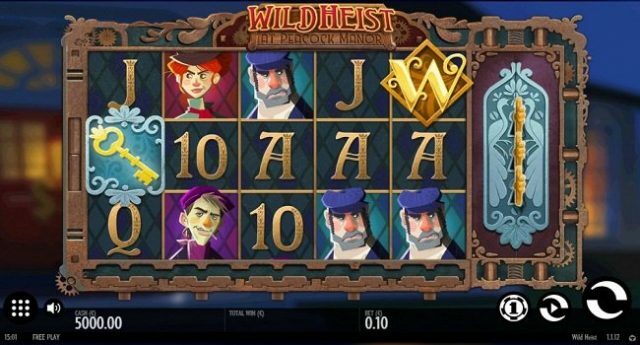 Wild Heist at Peacock Manor is a ThunderKick software based online video slot game of 5 reels and 10 paylines. Total coins for the site is 10 and you can play this slot using your desktop or mobile for 10p to €£100 per spin. This slot offers a jackpot of 8,500 times of your total stake and there are 4 bonus rounds available in this game which will offer you up to 10 free spin. The return of player percentage for the game is over 96%. Wild Heist at Peacock Manor slot comes with 3 randomly triggered wild features in bases game. One will give you free spins, one is multiplier and one is the base game mystery feature. This is a highly volatile slot machine which can be very beneficial for you if you are playing this slot for real money at any Thunderkick casino listed here. Wild Heist at Peacock Manor is based on a crime sage where 4 mastermind people will try to pull heist at the Peacock Manor. The reels of this slot contain symbols like A, K, Q, J and 10 and they are very dark in nature. The game contains a wild symbol which will replace all other symbols except the scatter and it is the highest paying symbol of this slot which would offer 20 times of your total stake if you are getting 5 of these wild symbols across a payline. Wild reel feature which will turn up to 3 whole reels in to wild. Random Wilds feature:- In this feature up to 7 wild symbols will be randomly added to the active reels and third feature of this game is Walking wild feature and during this feature each walking wild will move step left. If you get 3, 4 or 5 scatter symbols then it will trigger 7 free spins for you.